LST-635 was built in Seneca, Illinois by the Chicago Bridge & Iron Co, and was commissioned on 26 August 1944 with Lt. D. J. Lanphere in command. 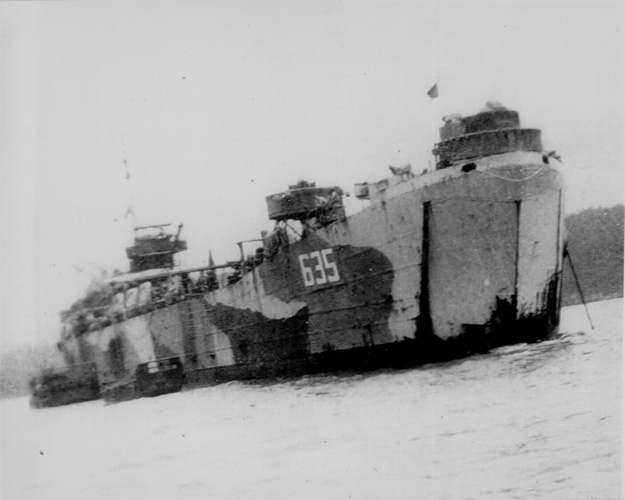 After World War II, LST-635 performed occupation duty in the Far East and saw service in China until early June 1946. She was decommissioned on 7 June 1946 and transferred to the State Department on 19 July 1946. Also, you can get a photo of the Lst 635 off of the internet. I found 3. Look up LST ships, 635. click on Lst photos, click Lst 635 (3 listed). The one with the crew in it, does not contain my father. it was taken 30 days after my father discharged. hope this helps. All names listed are still living, except my father, Art Cramer. Great work compiling information on LSTs. My father, John William Barrett, served on LST 635. I am looking for any photographs (good resolution)of crew members that may include my father. Are there any other resources on the web where I can find more LST 635 photos. Norman Deihl of Clermont, FL apparently has considerable information on the 635. Please contact the editor for more information.